A Canal On Rails? Read On! Calling all canal and train buffs... the Elblag Canal in Poland is like nothing you've ever seen before. It's a canal with wide-gauge railway carriages. This canal is an extraordinary feat of hydraulic engineering, and it was all built in the mid-1800s. ...so the engineers of that time came up with this ingenious arrangement. The entire system is operated by water power. 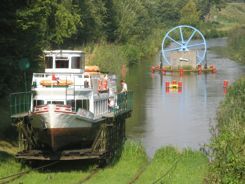 A series of rail mounted trolleys carry tourist boats and some private boats and their passengers across five inclined slipways. The difference in water level is approximately 100 meters (328 feet) in only 9.6 km (6 miles). On a recent trip to Poland, we had to see the Elblag Canal for ourselves. 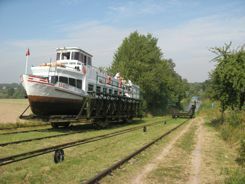 We first caught up with the boats that take passengers along this canal in the city of Elblag. We didn't have time for the canal ride. The full trip, Elblag to Ostroda, is 80 km (50 miles) and lasts eleven hours. We checked the departure schedule and left town about 10am. Where To See The Canal "Works"
We had a rental car, so we drove to the first spot we thought we could see the boats. We found the "Katy lift" on the canal. This was down a narrow back road. It took some searching. Sure enough, we arrived just in time to see the first boat coming around the corner on the canal. We waited, still not sure what to expect. The boat floated into what looked like a small dock with a narrow platform and handrails. The lower canal keeper blew a whistle. The top keeper it on, which turned an old fashion water wheel. This all eventually started gears in motion turning big drawing wheels. We were at the top of the hill, watching as the "dock" at the bottom emerged from the water with the boat cradled in it. The whole thing was riding on wide-gauge rails. The surprise came when we turned around.... and an empty trolley had emerged from the depths of the uphill pond. It looked like a "ghost ship" coming out of the water with vegetation hanging off of it. Guess we should have anticipated this as it is a counter balanced system like a funicular, but the surprise was fun. And The Boats Float Out When They Reach The Next "Step"
Once the boat floats out of the trolley/dock at the top, the waterwheel is turned off and the whole system shuts down until the next boat arrives. We drove like crazy over very narrow back roads to Buczyniec to see it all over again. This time there were two small private sailboats taking the ride down as the tour boat came up. Buczyniec is the top of the five "ramps" or steps on the Elblag Canal. There is a museum and a small snack shop where you can get Polish sausage. Tour buses bring passengers to this point to board the boats for the trip to Elblag or pick up tourists that came up only one way. You can catch the tour boats round trip from Elblag, or you can take the trip one way up or back. 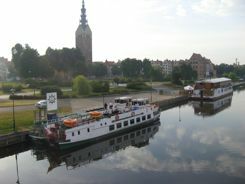 In summer, boat trips from Elblag leave the pier next to the Old Town at 8am sharp. The tour boats are equipped with snack bars. It takes about 5 hours to get from Elblag to Buczyniec; the bus ride back is only about an hour. We were driving, so getting to Elblag and beyond was a great way to get out into the countryside. You could also get to Elblag by train or bus from Gdansk. It is only about 80 km (50 miles) from Gdansk. For something just a little different in Poland, check out the Elblag Canal.